I have had a family request to look at tarot for the above two people who went Missing on November 23 in 1968 which is over 40 years ago. Unfortunately to get a picture to meditate with produced a report with it therefore there is other information there to begin with. I had a very brief look at tarot and Im just going to record what it gives to me. I have to ask you to read the notes on my blogger and tarot as tarot is not guaranteed as 100 per cent accurate but I hope that there are always some glimpses there that might reflect the situation. Tarot is also past present and future and will record events from any of those time spots. Because we are talking about TWO people here some information could get mixed up so I may have to ask for both as well as together or we cannot give what tarot is trying to say for the individual. My first card is Knight of Pentacles reversed. Now before I say anything, I had an earlier look at tarot and did not record this wanting more confirmation. This card confirms a few things to me and I will explain what I feel I have been given. This card above is a male who is very dilligent. He likes to be protective and he wants to work hard to make the future go right. He sees the future as a place where he can do well and from this card we know this person is not a matured adult. This card though is reversed - the terrain here is muddy paths and trails. This shows someone who just cannot take responsibility and does,nt have a job or money to offer protection or security and it is a weakness in its own way. There is a feeling that the future looks very difficult and especially financially. It is reported that Maureen might have been pregnant and if this is the case then this card would reflect the fact that there is responsibility on the horizon and nothing to support security. The card before the Knight is the Page, pages can be messages that relate to the Knight. Pages can also be children therefore this could connect these two cards together. The Knight of Pentacles definately gives the impression that 'one is stuck' because this Knight might have had a spur of the moment decision to change residence. As that is reversed it does,nt seem to show that could occur or happen because for some reason the 'travel' in this card is disrupted and some plans or changes were delayed. It may be that both of these people realised that they were young and that their future was blocked with a lot of 'empty prospects' or realised somehow that there was too much responsibility ahead that they could not take on. Now either that was SAID to them because we do have a Page there in the picture that seems to be reminding them that they are young ( I see to have army or military connected to that) so it could have been a bit of militarian point of view perhaps - or it was something that both or either of them thought themselves. I am feeling they could very well have been SPOKEN to because the card previous to the Page is the 10 of Pentacles and that card is Home and Family. It is possible that someone from either of the families might have had something to say? The card following the Knight of Pentacles is the Queen. The Queen is often thought of as a Mother Figure which is a wife, caregiver or homemaker. At this point I am not sure if it is reflecting the wants of Maureen or whether it does actually reflect a mother figure or the nurturer of one of these people. But it does seem to bounce of what has already been known about the two people in question. The focal point is that they are young and they are too young either in their own eyes or the eyes of someone else to be able to 'make a future' at that point of time as they would not be able to be financially responsible for themselves. Either that or one of them thought that. If one of them thought that it is pointing to the 'Male'.I need now to seperate these two people. I asked tarot what happened to Allan Whyte on 23 November 1968. Tarot is going to give me its answer which will be an answer past present or future. As you can see on the card above, this is a very concerning matter. suspicions doubts and also a 'shady character'. If I was honest this could reflect someone who was thinking of 'abortion' because the card reversed releases all those fears and they feel as though they have 'got over something' giving them back a bit of hope for another day. This is a THINKING card and NOT a DOING card, so these are thoughts. Perhaps he thought that if an abortion could be performed then he could at least look to the future more. Im not thinking Allan was keen on a child as taking into the Knight of Pentacles reversed it appears that he comes up there as one of the people who are immature and unable to take responsibility financially. There is an 'imprisonment' feeling on the 9 of swords and reversed it releases that feeling. The card previous to the 9 of swords is the 8 of swords which is someone feeling 'imprisoned' but its all in the mind and reversed it is a release from that feeling. The card following the 9 of swords shows someone who feels a sense of total ruin shown in the 10 of swords. So this is not looking that wonderful. Before I try to put this together, lets look at Maureen. When I ask about Maureen using the same question for the same Date I get the Ace of Cups reversed. The cup has an M or a W on it. It could signify Allans surname. This card shows us that there is 'wishful thinking' in a relationship and imagining a lot of love fantasies which are not there. It also seems to suggest she is impressed by 'physical beauty' so I hope she was not 'looking at someone else' that night. This card can also signify wanting to get out of a 'non working relationship'. Or it can suggest that she did,nt have feelings for a person. So Im wondering if theres jealousy here where it might have looked as though she was looking at someone else? Was Allan a jealous nature? OR linking this into news reports is this connected to the Child because it is not his and she herself does not want this child? because she is not interested in the relationship and this could be the father of the child. Putting it together, I think there were thoughts of abortion either both of them or one of them and not the money on the horizon to do this nor perhaps any sense of maturity here. These two people clearly had a few problems between them. Their future seemed to be in question and it did affect them. The Ace of cups could produce a new love affair which is why I wondered if Maureen was looking at someone else and if that was the case then it puts a bit of problem between her and Allan. I cannot be quite clear here yet which it is. But if we look at the next card - its the two of cups reversed and seems to suggest ' a tiff between the two who are in love' so perhaps it was all about a 'misunderstanding' of feelings on the night in question? It might not be them themselves who had that tiff but it was either between them or somehow connected to them and other 'friends'. But my actual feeling is that they had a tiff between themselves because of possibly someone flirting when they were out. Then this caused a seperation between them both and one of them walked off. I think that person is Maureen because they could not solve the argument or the quarrel/discord. Maureen may not have fancied anyone else at all but it might have looked like that, consequently it might have caused a rift between her and Allan. It could also be the other way around where Maureen might have thought Allan was looking at someone. They are both young and these kind of emotions are not uncommon. So now we have Allan with the 9 of swords on him and Maureen with the Ace of Cups reversed. Asking where Allan was on 24 November 1968 the tarot is seemingly pointing out a jealous rage and disruption of home and family. This card is someone who is not yet a mother. It could be talking about the jealous rage of a female, himself or someone else. This card has a numbe 3 connected to it. It also shows the Empress as Earth and this is reversed. Under the Earth? This man is 'smothered' in this card and he is,nt going anywhere that I can see. can mean more than one thing either The Reversed High Priestess also indicates that the person is in a physical relationship or is in love with someone, but is immorally having another physical relationship with someone else. It indicates infidelity or it can show lack of control and total abuse. Someone is 'dumping' someone else here. These cards are reflecting events 'around' the question and we have to puzzle them to put it together and what seems more likely. There is possibly someone else here and I am feeling that there are three people involved in this relationiship. Allan could have been having a relationship with another girl or it could be Maureen with another boy - either way, whichever TWO are the ones are also the person that is the reason the 'other one' disappeared and indeed ultimately why they BOTH disappeared. The High Priestess reveals initials - B and J which may be places or people who can throw light on where Allan was/is on 24 November 1968. But, this card has BETH on it in hebrew and that represents a HOUSE/HOME as that is reversed it shows him NOT in the home but outside of it. The High Priestess is reversed and gives us a Monday. The 25 of November 1968 is a Monday. The Magican previous to the High Priestess shows disappearance and an 'easy way out'. The empress herself shows a plan that just has not worked out and thats why I cant see any 'action' with Allan on 24 November. This shows her swiftly moving outside to a house near a hill. The eight of wands is speed - so she is going to a place near a Hill. This movement is because of a 'message' - and through a quick decision. The card previously shows Pyramid Hill which is the card that I had for Crystal Fraser and I know this couple are connected to Bendigo. That card is 7 of wands where there is a HILL there too. So now we have two hills which one? The point is she is MOVING QUICKLY to a HILL. Did she go off with someone else? there are lots of pointers here but nothing is set in stone. This card the 8 of wands is exact timing. Dates & Timing: November 23 to December 2 showing that she was west or south OR - SOUTHWEST but somebody could have been chasing her because she might not have got there. The card previous shows a lot of quarrelling and an opposition to someone who is attacking them. The 9 of wands shows someone looking left and right and hiding behind some kind of fence or posts. They look injured but not deceased. Something happened to this couple either one attacked the other, or another person came into the picture here. It may have been an authoratative male figure and this could be because of a tiff or fallout between the couple over flirting and the upset about that afterwards. Im not really sure what else to ask except where they might today. We are told the present must not be relied on in other words take this card as a card which might show he may NOT be physical today but that he is either in the NORTH or the East or Northeast in a place that has some connection to money or treasure and I have KEY connected to this for some reason. This card has a number 6 on it. I have a card that connects her to her family home. There is a dog on this card which is supposed to be a clue. She is connected to the 9 of pentacles also which shows a garden of grounds near a garden where deceased bodies are. She is connected to NORTH in direction. This card signifies home of friends and family so I guess that she must be located in the area of whoever she considers are friends and family? That is all I have on this at the current time. It seems to show very many things but I always say you MUST seek a second opinion - tarot is not 100 per cent accurate - it does,nt judge, it does,nt point fingers it just gives what it sees and it is up to the reader to put the puzzle together as it is given in glimpses which can often sound muddled. There is a possibility that their relationship was opposed by someone else - but who that someone else is I cannot be sure but in Allans cards it seems to suggest a father figure? then again it may be his own feelings about fatherhood and the sterility of the Empress and the fact that the pregnancy reported with Maureen may be all part of this situation because either someone was told to take responsibility or someone did not want that. It is also possible that Maureen was not pregnant but told Allan this and that too could have caused the altercation that I have seen. There is definately some kind of lovers tiff and going seperate ways at some point. 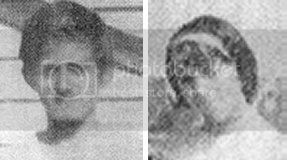 It seems that neither Maureen nor Allan were reported as runaways it was assumed they just ran off together. Police now feel it could be a murder. I have tried to see what else I could find.I have returned to this tarot as I wanted to ask why Maureen did not make it to her home at California Gully and I have been given 3 pentacles which seems to suggest a WORKPLACE. I understand that both of these two people worked together at Chrystal Egg Company. I am not quite sure if the 3 of pentacles might be trying to pick that up ? I am trying to piece this together and have looked at other cards and already saw someone who might be connected to army or military, soldier wondering if that was to do with Temperament. The three of pentacles can suggest work, The knight of pentacles has the Page of pentacles before it so can suggest someone 'known at work' - I also felt somehow that perhaps these two might have been seperated at some point I think Maureen was disappointed not to go to 'the party' which was suggested by Allans brother. I am seeing strange things in the tarot - I am seeing that between 10 and 11 pm or before someone might have turned up unexpectedly. In Allans cards between 9 and 10 there is some kind of bizarre encounter - and in Maureens cards I seem to see a Knight of Swords that is reversed. This sometimes talks about a dark skinned/or ethic type of person. He may have offered them a ride? but might have been more interested in Maureen and Im feeling that because of a possible 'rival' situation. The page of Swords would suggest someone offering a ride or a lift. I dont know what the distances were from where these two people were last seen to where they were going. But the Knight of Swords is NOT nice. I do see three people as said before but its very hard for me to decide exactly the situation here. I see that the next card would be the Queen of Swords which shows two people whereby one might die before the other. If this is the case then these two young people could be lost. I do see Maureen running towards a Hill and I know from the initial report the claims that are made there about her going to live in Swan Hill but I still dont know that she actually got there. The person I see as a third person has a stutter. I would have thought they were Male but I cant be sure. I always have to go back to cases if I get further cards to break it down further. Regardless I know this is a complicated matter and throwing light is difficult as I am picking up emotions places and happenings and need to straighten it out somehow. I just think that if they were walking this somebody obstructed them maybe by offering them a lift. A Knight of Swords is often on transport of some kind as he is swift. Motorbike maybe or car. I am looking at Maureen here at between 10 and 11 pm on 23 November 1968. I do see opposition here and its away from buildings yet I seem to have a work building connected and that is why I wonder if its a stranger or not or connected to their workplace? Forgive me if I am wrong here. If this person obstructed these two people then I am feeling if it is someone they knew it is linked back to the party that they decided not to go to, and if not then it is a stranger or someone from work they could have bumped into. That person is not fully adult I dont think as he is a knight and they are generally late teens and over.I dont know why but Maureen shows up as being a bit 'vain' in those periods of time and I cant make out why that would be. Im sorry to muddy the waters with this but sometimes I am 'called back' to look again and this is what has turned up. I really am thinking about a third person here but all I can do is leave impressions perhaps it was talking about a third person that brought up bad feeling. However, the Page of swords prior to the Knight of Swords suggests someone who offers some kind of Ride???? so that again seems to imply a third person and I do see a Blonde person or one who is blondish with reddish tints. I dont know what colour Allan or Maureens hair is. Anyway violent actions seem to be here and words definately - a few threats too. Between 11pm and 12pm Maureen according to 10 pentacles reversed was not far from home. There is fatality loss and robbery in this card. So to me that does not look good. I saw an altercation and her running across countryside or an open space towards a hill. Im seeing someone looking left to right injured in the head and the leg but at that point I saw down but not out. Tarot is not wonderful all the time for directions but I have North East or South West on the 9 of pentacles which is what I saw before about where she might be located. It seems to be near the family home. Going back to Allan - I have West at the time of 11 - 12 pm. Something has happened here between the three people or the talk of a third person. None of this looks good at all. It could be that each of them were attacked and were ok and got away but perhaps somehow something changed all that. I really am not sure if this helps or hinders. It really could be tarot picking up on the news stories but all I can do is write this down and hope someone can put it together. Perhaps we have to be careful about the 'three people' here because if it transpires that there were three people and anything happened to two of them, we need to ask WHICH TWO? There are ROSES connected to the cards and I see there is a ROSE street. Maybe there is a connection at that point? ?Looking at the Map I see that Munday Street is not far from Garsed Street where the coupled worked. I also note that there IS a railway there and the Page of Swords is connected to a HILL and more importantly to a RAILWAY or some form of transport that can take you for a 'ride'. I also note that you need to go North in order to get to Maureens home and on the way there is a ROSES street. I cant see past Roses street in the tarot but I know its close to home. I dont know if this helps in anyway. But, it seems to me that the Factory in Garsed Street seems to form an area where either this couple split up, or had an argument or they came into contact with the Knight of Swords or some altercation broke out. It could be what I am seeing about a person at work or connected but it would,nt then make sense regarding the possible 'military/army/person in uniform or that connection' so Im not sure whether that is valid or not. The more tarot I look at it seems to either confirm what I have seen or iron it out a bit. But Roses street might be of importance and the area around the factory as I feel sure absolutely this couple were near there. They could have been arguing or someone came along. It might be they went to the factory area to get on a train to go home as I see the railtracks circle towards the East and would take them to California Gully via some drop off point there? But Im not sure if they got on a train. The Empress also has Roses on her dress and I think this card came up alongside Allan. The Empress is also the card that comes after the High Priestess and I feel somehow that there could be something about Rose Street . I am not sure what exactly but I know I am not the best at location so once more I shall just leave this as 'information' and have no idea if its relevant or not. Here are some news report I have picked up of various dates this year. 22 Mar 2013 - Maureen Braddy's younger sister underwent hypnosis, inquest told · Father claims missing teens in Braddy-Whyte case are still alive. Some news reports I spotted but nothing current. 25 Mar 2013 - Many believe Maureen Braddy, 16, and Allan Whyte, 17, were ... She told the inquest that on the night the pair went missing, she saw her father .. Very interesting news has come to the surface recently in the case of Maureen and Allan. I might try and see if its possible to work out a map! Maureen Braddy and Allan Whyte families keen for answers as Victorian ... body through their front yard the night the teens went missing. I hope you get Justice in your family Jodie. Im glad some things that tarot has mentioned seem to resonate with you. I always say tarot is not 100 per cent accurate because I know that it is easy at times to misinterpret - but if any of the reading is helpful Im always glad to hear it. I send my regards and it was a pleasure to try to help you and your family. You are welcome Jodie. Keep me posted. A DOUBLE murder mystery that has haunted two families for almost fifty years is set to finally come to a close, almost two years after an inquest into their deaths ended. In what they’ve described as a Christmas miracle the family of Maureen Braddy were this morning told by the Victorian Coroner’s Court that coroner Iain West would finally hand down his finding into her disappearance next week. Maureen, 16, and her 17-year-old boyfriend Allan Whyte haven’t been seen since they returned from a bush dance in Bendigo in November 1968. They were treated as young runaways for decades before police announced they were treating their disappearance as a murder investigation. For more than a decade police have suspected Stanley Braddy, Maureen’s father, of being involved in their deaths. Coroner says lack of evidence to charge Deputy state coroner Iain West has handed down his findings following the inquest into the disappearance of Maureen Braddy and Allan Whyte. He has found there is ''simply a lack of evidence'' surrounding the disappearance of Maureen Braddy and Allan Whyte. He acknowledged while he believed they were dead, and foul play was most likely involved, there was not enough evidence to charge anyone. He gave four main reasons for his findings, including the fact no bodies had been found, there were no eyewitnesses to the crime, there was no strong circumstantial evidence and "there is a simply a lack of evidence". He said that suspect Stanley Braddy, Maureen's father, was "uncooperative and evasive", stating in his report that "the behaviour of Mr Braddy at the time of the disappearance and the time subsequent is highly suspicious". The report states that Mr Braddy's whereabouts could not be accounted for the afternoon following his daughter's disappearance, and his assertion he was with his wife and daughter Rhonda that day were contradicted by the two women. He said he found Mr Braddy to be "a most unreliable witness who had no interest in assisting either my inquiry, or that of police". The report also notes "there is evidence of Mr Braddy being violent towards his wife and children". But he said there was not enough evidence to conclude Mr Braddy was either directly or indirectly involved in Braddy and Whyte's disappearance. "Suspicion and speculation cannot be the basis for making findings of fact," he said.